SNAG’s first Jewelry and Metals Survey (JAMS) is now available! 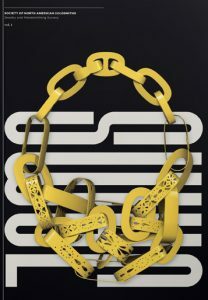 This annual publication highlights the best new work being made in the international field of jewelry and metals. The jury has selected the top 100 images from the submissions. The 2017 jurors were Vivian Beer, Cornelie Holzach, and Alan Revere. Each juror has also selected additional images to be published. Learn more and order your copy today. SNAG would like to take this opportunity to recognize our Corporate Members for their support: Halstead, Pocosin Arts, and Shapeways.